Pakistan officially the Islamic Republic of Pakistan is a sovereign country in South Asia covering an area of 796,095 sq.km. (307,374 sq. mile). With a population near to 190 million people ranking it at sixth place in world population table. Located at the crossroads of the strategically important regions of South Asia, Central Asia and Western Asia, Pakistan has a 1,046-kilometre (650 mile) coastline along the Arabian Sea and the Gulf of Oman in the south and is bordered by India to the east, Afghanistan to the west and north, Iran to the southwest and China in the far northeast. It is separated from Tajikistan by Afghanistan's narrow Wakhan Corridor in the north, and also shares a marine border with Oman. According to Ministry of Climate Change, Government of Pakistan the country consists of 26.9% of range land, 24.5% of exposed rocks, 19.9% of agriculture land, 10% of open land, 9.7% of deserts, 5.4% of forests, 2.2 % of snow/glaciers, 0.5% of water bodies, water logged and saline bodies. Out of 79.6 million hectares of total geographical area, about 27 percent of the area is currently under cultivation. Of this area, 80 percent is irrigated. Pakistan has one of the highest proportions of irrigated cropped area in the world. The cultivable waste lands 8.25 % offer good possibilities of crop production. Pakistan is divided into three major geographic areas: the northern highlands, the Indus River plain and the Balochistan Plateau. Ranging from the coastal areas of the south to the glaciated mountains of the north, country’s landscapes vary from plains to deserts, forests, hills and plateaus. Wikipedia. Pakistan. [Online] Available at: [Accessed September 2012]. NEIMS. Land Use Atlas of Pakistan. [Online] Available at: [Accessed September 2012]. The territory of modern Pakistan was home to several ancient cultures, including the Neolithic Mehrgarh and the Bronze Age Indus Valley Civilisation. The area has been ruled by numerous empires and dynasties, including the Indian Mauryan Empire, the Persian Achaemenid Empire, the Arab Umayyad Caliphate, the Mongol Empire, the Mughal Empire, the Durrani Empire, the Sikh Empire and the British Empire. In the twentieth century Mr. Muhammad Ali Jinnah led a struggle for the rights of Muslim minority in the Indian sub-continent and as a result, Pakistan was created on 14th August 1947 as an independent country. Constitutionally remaining a dominion for some years, Pakistan adopted a new constitution in 1956, becoming an Islamic Republic. Pakistan is a federal parliamentary republic consisting of four provinces and four federal territories. It is an ethnically and linguistically diverse country. Urdu is the national language and English is official language. Pakistan is a federation of four provinces: Punjab, Sindh, Khyber Pakhtunkhwa and Balochistan, as well as the Islamabad Capital Territory and the Federally Administered Tribal Areas in the northwest, which include the Frontier Regions. The Government of Pakistan exercises de facto jurisdiction over the western parts of the disputed Kashmir region, organized into the separate political entities Azad Kashmir and Gilgit–Baltistan (formerly Northern Areas). Local government system consist of a three-tier system of districts, tehsils and union councils, with an elected body at each tier. There are about 149 districts altogether. The Tribal Areas comprise seven tribal agencies and six small frontier regions detached from neighboring districts which are administered by the Federation. Figure 1: Four Provinces and Federal Territories of Pakistan (source: http://en.wikipedia.org/wiki/Pakistan). The development of Cadastral System of Pakistan has a common history with other counties of the region. The tax on land was initially collected through community head or a government official. Normally, the size of area indicated by the community was accepted. Historians have traced the regular survey and measurement of land during the rule 0f Alluddin Khilji (1296-1316) when the ruler attempted to collect revenue directly from farmers. He hired large number of accountants, agents and collectors. The system was further improved during the period of two rulers Sher Shah Suri and Akbar the Great (1540-1605). ‘Ain-e-Akbari’, a book written by one of the Minister Abu’l Fazal, during the Akbar reign has recorded the measurement of provinces and sub-provinces of empire. The British adopted the existing revenue collection system but to assess the revenue they carried detail survey of the land and this exercise was named as ‘settlement’. The purpose of settlement was to determine that who will pay the assessed amount. During the settlement cartographic sheets were used on which the parcels of land with unique number and measurement of area was indicated. The tribal areas and inhabited areas, however, remained excluded from ‘settlement’ during the British period and also thereafter. Land Administration is a provincial subject. But the laws and rules promulgated by the Provinces and Federating Units are in conformity with each other because before region now comprising Pakistan was administratively one unit till 1970. The land related data is possessed and maintained at the level of provinces and federally administrated areas who feed the Federal Government for compilation of data. A variety of data sources dealing with different data types including topographic maps, land information, social and economic data, statistical records, satellite data/ aerial photographs and revenue records operate in the country with specific tasks. For example, Survey of Pakistan (SoP) is responsible for preparing, archiving, updating and maintaining all kinds of topographic maps at varying scales. The provincial, divisional, district and Tehsil or taluka boundaries are also available with SoP. The land and revenue records are maintained by the local administration of provincial departments. For Rural areas records of lands are exclusively maintained by Provincial Boards of Revenue through Revenue Officers. Record of land ownership according to survey number wise is maintained even in the urban areas by the Provincial Boards of Revenue. However area which is controlled by Ministry of Defence or which has been allocated to Urban Development Authorities and Private Housing Societies; the concerned organizations maintain the individual holdings record. Although sale-purchase transactions of land falling in the Rural Areas can also carried through sale-deeds registered with Registrar appointed by the Government, but presumption of truth is attached to the land record maintained by government officials. USAID Country Profile. Property Rights and Resource Governance-Pakistan. [Online] Available at: [Accessed September 2012]. All most all of the cadastral surveys and registration in Pakistan are undertaken by the state government departments such as Board of Revenue (BoR) (at provincial level) in rural areas and Government Development authorities (DAs) in urban areas. Private sector involvement is only in limited number of urban areas where land/property falls under the jurisdiction of private housing authorities. In such case only the land registration and survey is carried out by responsible private body. In some cases private sectors are now being involved for generating GIS and LIS for better management of land resources. There are two main professional organizations in Pakistan that are involved in surveying and mapping. First is Survey of Pakistan (SoP) which is responsible for preparation and maintenance of all sorts of topographic land surveys of areas of entire country on the scales of 1:50000, 1:250,000 and 1:1,000,000. SoP carries out survey activity using latest digital equipment and surveyors but no. of surveyors are not reported. Other than that, second professional organization is Board of Revenue (BoR) which is the controlling authority in all matters connected with the administration of land, land taxation, preparation, updating and maintenance of cadastral records. Cadastral surveys are carried by Board of Revenue through its regular employed staff known as “Patwari or Tapedar”. Besides carrying out survey Patwari is also responsible for 1) the maintenance of record of the crop grown at every harvest. 2) The keeping of the record of rights up to date by the punctual record of mutations. 3) The account of preparation of statistical returns embodying the information derived from the harvest inspections, register of mutation and record of rights. According to an estimate there are 14000 patwaris in Pakistan responsible for approximately 190 million land records which contain data of 50 million land owners. Patwaris have their professional associations to protect and bargain their rights. In Punjab province a separate Punab Land Record Authority has been created in year 2017 under BoR to maintain and update the land record. However he updating of map is still job of the patwari or Tapedar. Panchaud.N., 2010. Cadastral System in Pakistan Present Situation and Future Challenges, Cadastral Systems-Essay. [Online] Available at: [Accessed September 2012]. The Land Revenue Act which regulate the land administration provides that survey can be carried out by an agency other than that of Revenue Officers and village officers but for that purpose Board of Revenue will identify the local area to be surveyed and the nature of survey, the names of persons to be engaged and the kind of boundary marks to be erected. The officials engaged will have the same powers as entrusted to government official. But this legal provision has never been used for the cadastral mapping. However sometimes powers have been entrusted to different government officials for carrying out the survey for acquisition of the land. Therefore, all the cadastral survey work is carried out by the government surveyors of state. Surveyors hired by survey of Pakistan are Diploma holders in Civil Surveying or Civil Engineering. While Board of Revenue has its own system of training of newly recruited Patwaris (surveyors) and proper syllabus for education, training and examination of Patwaris is in place. There are no devoted educational institutions for granting degrees in surveying. But surveying related subjects are offered at all engineering universities in Pakistan under four years bachelor degree of civil engineering and there are postgraduate level study in geo-information in few selected universities. Besides that, Survey of Pakistan, Board of Revenue impart education to their staff. Board of Technical Education and some private institutions do offers certificates and diploma ranging from three months to 12 months in ‘Survey Trade’. The Cadastral System has backing of numerous laws ranging from collection of revenues, transfer and acquisition of right of immovable property, consolidation of land holdings, colonization and acquisition of land for public purposes etc. Though these laws have been promulgated by Provinces but the contents of Acts are same. The cadastral system have legal, fiscal and other multipurpose roles. The maps prepared by staff working under the Board of Revenue, helps in planning and control for land allocation to government department and agencies since no government department can acquire the land without the approval of Board of Revenue. Under the Acquisition Act 1894, the government can acquire land for public purposes both for government agencies and private companies. Cadastral system of Pakistan has been inherited colonial period of British rule in the sub-continent which lasted till the middle of 20th century. The British colonial government introduced scientific and large scale cadastral system aimed at ownership delineation and tax collection. The system was designed to maintain, transfer and access of land and to collect revenue and other levies from the land holders. Current manual cadastral system of Pakistan is approximately 500 years old so it does not provide sufficient base for an efficient land record management. However the efforts are in way at various stages to computerize the land record but it may be termed as digitization of existing record and to some extent the incorporation of changes in the titles of land holding but it is far from a comprehensive SDI. The cadastral system covers the whole area of Pakistan except tribal areas and inhabited areas. But the authority to manage the Cadastral System lies with Provincial government who enforce it through respective Boards of Revenue. The Federal government’s Ministries and even Armed Forces are bound to approach Board of Revenue for acquisition or transfer of rights over land. The forest land in the record is indicated as State land and by an amendment in Punjab Forest Act 1927, the nature of protected or reserved Forest land cannot be changed. All mines of metal and coal, all earth oil, gold washings belong to state even they are not entered in the land record as such. In the record of Board of Revenue, the inhabited areas at the time of settlement were referred as ‘within red line’ (Lal Lakir). Many areas which were part of agriculture or rural land at the time of settlement are now included in urban areas. The maps and record of Board of Revenue is therefore still used to determine the ownership right of such land now falling in urban areas. Hence the cadastral system also covers certain urban areas. In urban areas Cantonment Boards and Excise and Taxation Departments have certain jurisdiction and maintain their own record of properties but it is only for collection of certain taxes. The transfer of rights on land can only be executed through Board of Revenue. The transfer of real property in urban areas is executed mutually by the parties but it is mandatory to get register documents with the officers under the control of Board of Revenue in compliance of ‘The Registration Act 1908’. While registering sale deeds, these officers are not supposed to perform detail enquiry regarding authenticity of text of document. This leads to frauds, litigation and land grabbing. The Development Authorities in Public sector and private housing companies or societies, can transfer rights of such land which they have purchased either from the government or private individuals, provided they have got ownership rights. The rapid migration to urban areas since 1970s, rising cost of land and non-introduction of low cast housing schemes in public sector have encouraged illegal settlement and squatting. To regularize, develop and improve these settlement Provinces have introduced ‘Katchi Abadi Laws’ and established ‘Authorities’ under these Acts. The linchpin in the land administration system is ‘Patwari’, who works in the field and is custodian of record. The name of Patwari is found even in literature and books of ancient India. ‘Qunongo’ (named Girdawar in some areas) supervise the work of patwari and verify entries in the record. Assistant Collector, Collector, Commissioner and Board of Revenue have supervisory role and have different sanctioning and appellate powers. West Pakistan Land Revenue Act 1967. This has been adopted by all provinces. The primary unit of a parcel of land is Survey Number or Khasra Number (in local language) which have a unique number in an ‘Estate’ and is registered in record of rights as such. A survey number may have part of its area cultivated and part uncultivated or part of one soil and part of another. A Survey number may be owned by a single owner or several owners. As such scenario no (ii) in question 2.3 on page 6 is applicable. The Estate is different from a village and may comprise of one village or several villages. This term is a legal expression defined by the Act and forms the unit of revenue assessment and land administration. The boundaries of the estate are defined by boundary marks on the ground and on the map maintained by Patwari. The maintenance of boundary mark is the responsibility of the community. 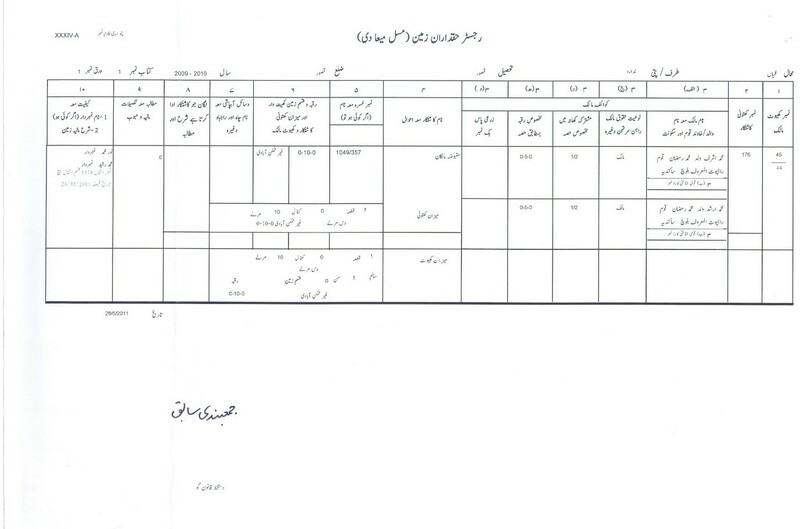 The separate columns are maintained in the land record to show the ownership and actual cultivation of a particular Survey number. The cultivation may be by the same owner or by a tenant. The holdings of landowners are indicated as ‘Khewat’ and of tenants as ‘Khatooni’. The separate record of tenants in the land record protects the rights of tenants in the case of dispute over title and rents etc. Owner of land and land owner have distinguished entity. Every owner of land is a “land-owner” but every “land-owner” is not owner of the land. Mortgagees with possession are certainly land-owners within this definition but they are not owners of land. Property: The word property has been defined as the right and interest which a man has in lands and chattels to the exclusion of others. It means not only the physical property but also rights in property. Land: It includes benefits to arise out of land and things attached to the earth. Survey Mark: Any mark set up by the Department of Survey of Pakistan. Survey Number or Khasra Number: A portion of land of which the area is a separately entered under an indicative number in the record of rights. Landlord: is a person under whom a tenant holds land and to whom the tenant is or but for a special contract would be liable to pay rent for the land. Land-owner: A person to whom a holding has been transferred or an estate or holding has been left in farm, for the recovery of an arrear of land revenue. Real Estate: According to ‘The Punjab Real Estate Agents and Motor Dealers (Regulation of Business) Ordinance 1980’, the “real estate” is an immovable property, including land, benefits to arise out of land, and things attached to the earth, or permanently fasted to anything attached to the earth. Holdings: A share or portion of an estate held by one landowner or jointly by two or more land-owners. Vernacular equivalent is ‘Khewat’. Ownership Units: The Karam or Kadam is a main unit of measure of length. Its length is 66 inches. The square karam is known as Sarsahis and nine sarsahis make one marla. A kanal comprised 20 marlas. The housing colonies mostly used the terms of Marla and Kanals. One Marla is 20.90 sq. meter and one Kanal is 420 sq. meter. Village Notebook (Lal Kitab): has valuable information and statistics regarding crops grown in the estate, soil classification, area under different crops, land use, transfers in land, wells and other means of irrigation in the village and abstract of the livestock and cattle census in the village. The computerization of land record was attempted as early in 1973 as a pilot project but remained unsuccessful. In 2004 Provincial government of Punjab started the computerization of land record in a phase manner with the assistance of World Bank. Initially the availability to copy of record of rights to stakeholders and transfer of rights over land through computerized system is the target. Though other Provinces have also started the work of computerization but the Punjab Province it has lead in this initiative and has completed 85% work. At the service centers established at Tehsil level initially following computerized facilities are provided. The survey of Pakistan a federal government Department carries out the survey of the whole territory but their maps only show the physical features and don’t help in determining the ownership rights. For indicating minerals, forests and other installations the concerned departments use these maps as base sheet. The relevant to land administration is cadastral or field survey made by Patwari. He draws a field map (shajra kishtwar) showing the position and boundary of every field (survey number), and record the area of each field and the class or classes of land which it contains. Though cadastral system is managed manually but it has detailed and comprehensive instructions on every operational aspect and have backing of laws. Different tiers of supervision are supposed to inspect the record regularly to ensure the correctness and transparency. But with the passage of time, supervisory and administrative control over work of field officers (Patwari, Qunongo etc.) has weakened and there are a lot of issues of transparency and reliability. In Pakistan for each ‘Revenue Estate’ (Mouza) a separate cadastral map is prepared at the time of ‘Settlement’. The Settlement is carried out under the instructions of Provincial Boards of Revenue and the purpose is to settle the land revenue with landowners to be paid by them. Normally Settlement or survey is carried out in one district of a province at a time and after completion it is started in the next district. A cadastral map of a Revenue Estate prepared on paper is called “Mussavi” in local language. Pakistan’s cadastre map is paper based graphical representation of land parcels which are drawn at large scale . It shows all the fields, duly measured and numbered in a village or Revenue Estate. This is basically a surveyed paper map at different scales depending upon village area, normally at a scale of 1″=40 Karam= 200’-220’ (about 1:2500 scale or so according to parcel sizes in the village). The yard-stick of measuring a field is called Karam which is 5.5 feet in length. Land parcels are labeled with their Khasra Number (parcel identification number) and dimension of each side. For the facilitation of Survey staff the same map is also drawn on white cotton cloth called Shajra Parch or Latha. The Survey staff during their visits to village carry ‘Latha’ which shows the measurement of all pieces of land in that village because it is easy to handle and paper map is consulted when in office if required. A copy of the same paper map is kept in Tehsil Office, a sub-division of a district. Whenever there is transfer of land from one party to other, Patwari is bound under the Manual to draw a Shajra Tatima which is basically map prepared of a portion or portions of a survey number to indicate the division of land among the owners. The Shajra Tatima indicates the measurement of each new unit in a survey number. The new units retain the old survey number but to differentiate and identify the newly created units these are numbered as 1/1, 2/1, 3/1 and 4/1 so on. Each Khasra Number can be owned by a one owner or many owners. After a new settlement new survey number is allotted to every piece of land. Village boundaries are demarcated through tri junction pillars which are erected at every point where boundaries of more than two estate meet and are also shown on map by using red polygon like shape at the boundary. Every map has a proper title (consisting of village name and village identification number, tehsil and district name of which it is part, along with the date when it was made) and legend which explains the symbology presented in the map. Sometimes natural and manmade features are also shown on map for referencing purpose like prominent road, river, stream etc. but they are not always part of the map. More over built up area like houses and buildings are never shown on these hand drawn village maps. Figure 6: Cadastre map of two different areas in Pakistan (1) Islamabad rural area (2) Attock (Punjab province area) and their zoom in view (Source: Adeel, 2010 ). Currently in Pakistan the use of cadastral information is only limited within the fields of land administration and taxation and currently it is not being used for other purposes such as utility mapping, e-government and civic empowerment. One reason for that is the manual nature of existing cadasters which are difficult to comprehend, update and thus difficult to integrate in other types of spatial information. The computerization of land record was envisioned as back in 1992 in Punjab province and a pilot project was initiated in Kasur district of the Province. But it could not be completed because of rapid changes in software, bugs and lack of support of the provincial government. In 2004 the initiative to computerize the record in two districts was undertaken but later it was decided to take a holistic approach and extend it to the whole of Province. The Government of Pakistan on February 2007 signed a contract with IDA (World Bank) to finance the implementation a project “Punjab Land Record Management and Information Systems” in the Province of Punjab. After completion of initial phase the Punjab Government has established a “Punjab Land Record Authority” in 2017 to administer the computerized land record. The other provinces has also started the process of computerization of land record and are at different stages but none has able to provided service delivery so far. Currently all the provinces are targeting the digitization of land record and it cannot be termed as computerization in the real sense because it is not providing holistic solution. All what is being done is outside of SDI domain. 1)Governance Related Issues: The comprehensive legal framework governing land rights is enforced but due to Corruption of employees and nepotism by political leaders in the appointment of Revenue officers, who administer the laws related to land, place poor, women and marginal communities in disadvantageous position. 2) Obsolete and Opaque Cadastral System: The existing manual system of maintenance of record, consisting of paper maps and registers has become obsolete and opaque with the ever increasing user - interactions and dimension of land rights. More over Land records do not provide either conclusive proof of ownership nor are they linked to spatial data to perfectly identify the plot which gives rise to many land related disputes, cause delays in resolving pending cases and access to land related records. 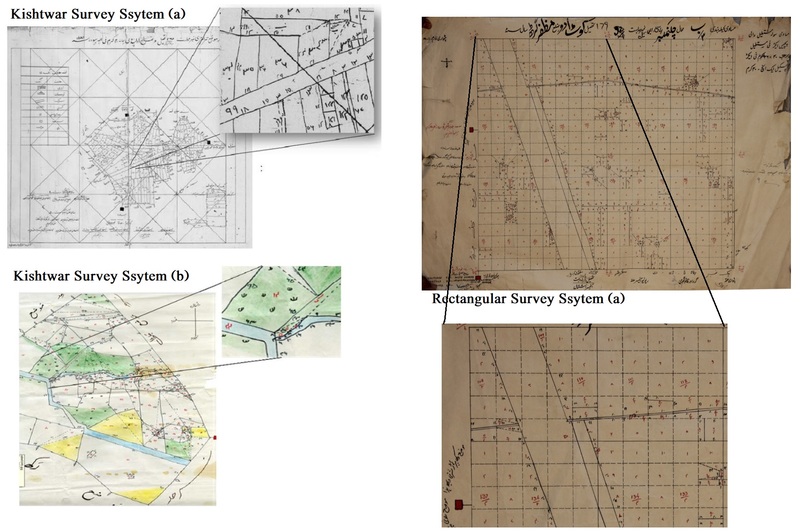 3) Reliability of cadastral information: Cadastral Maps are prepared in indigenous language using local obsolete surveying techniques and bearings and measurements. Therefore, each map sheet has its orientation and accuracy. Consequently sometimes the edges of the map do not match with that of adjacent sheets. Cadastral maps are not integrated with national datum so that the land parcels cannot be integrated in other developmental activities launched by the government. 4) Synchronize laws and rules with Computerization: The current laws and rules administering the land record were envisioned when it was handled manually. Now when there are efforts to digitize the land record appropriate amendments in laws are also necessary. Supreme Court of Pakistan, in an order in June 2012 order directed all provinces to replace the manual system with digital records. All provincial government and administrative areas had started work on the implementation of the order. This is an enormous task considering the numbers of land owners and cultivators whose record is to be digitized. The Punjab provinces is ahead and has established a separate authority for land record and has established Kiosk at every Tehsil headquarter. Other provinces are at the stage of data entry regarding area of land and land owners. After implementation of projects, the people will get record of their rights and transfer of ownership through Biometric from Kiosk especially established for this purpose.